On this date in 1944 staff at Gen. Dwight D. Eisen­hower’s Supreme Head­quarters Allied Expe­di­tion­ary Force (SHAEF) esti­mated that since the start of the Nor­mandy landings on D-Day, June 6, 1944, one million Ger­man soldiers had been killed, cap­tured, or taken pri­soner by Allied armed forces. By the end of the war, the figure of Ger­man mili­tary dead stood at 5,533,000, with another 1,760,000 civil­ians dead. Some of the Ger­man civil­ian dead died in mas­sive Anglo-Ameri­can air raids. Two book­end events, one in Ham­burg in late July/­early August 1943 and the other in Dres­den in mid-Febru­ary 1945, killed some 65,000 peo­ple as fire­storms swept through civil­ian neighbor­hoods and mili­tary facili­ties. By con­trast, U.S. war dead in all thea­ters totaled 416,800 out of 15 mil­lion men and 350,000 women who served in the armed forces. Britain and her Com­mon­wealth mem­bers suffered 575,000 dead. Italy suffered 301,400 mili­tary and 153,100 civil­ian deaths. Poland lost 160,000 ser­vice mem­bers and 5,440,000 civil­ians, a figure that in­cludes vic­tims of the Holo­caust. The war between China and Japan was the longest in the series of con­flicts that made up World War II (1937–1945), and China suffered more mili­tary deaths than any other nation apart from the Soviet Union: 3,000,000 to 4,000,000 Chi­nese ver­sus 8,800,000 to 10,700,000 Soviet nationals. Civil­ian deaths were many times higher for both coun­tries: 16,200,000 Chi­nese civil­ians died during the con­flict, while 12,400,000 Soviet civil­ians died. Japan suf­fered 2,120,000 mili­tary deaths and a mil­lion civil­ian deaths, mostly in U.S. attacks on Japa­nese popu­la­tion centers. 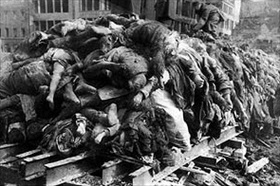 In a March 9–10, 1945, air raid on Tokyo, 100,000 died mostly by a fire typhoon that engulfed 16 sq. miles of down­town Tokyo. Fewer civil­ians died in each of the atomic bombings of Hiro­shima (70,000–80,000) and Naga­sa­ki (40,000–75,000) in August 1945. Esti­mated World War II mili­tary deaths by all par­ti­ci­pants range from 22,597,200 to 25,497,500 out of the 110 mil­lion who served their coun­try, while civil­ian deaths range from 34,664,600 to 46,909,600. On top of that huge figure are probably three times as many wounded and an untold num­ber who were emo­tionally scarred by their experi­ences or the loss of loved ones. The scope of human suffering was immense. Above: Hamburg’s Old Town and asphyxiated victims of Opera­tion Gomor­rah. The “second city of the Reich” was the tar­get of a human version of the wrath of God (as implied by the name of the opera­tion) on July 24–26, July 28, July 30, and August 3, 1943, when the Royal Air Force bombed by night and the U.S. Eighth Air Force bombed by day. A July 28 fire­storm that lasted three hours and created a 1,500-foot-high vor­tex of super-heated air killed more than 40,000 persons in and around Ham­burg. 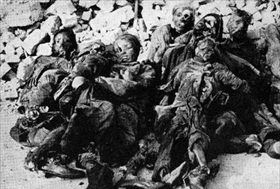 Most people died of asphyxiation while huddling in bomb shelters and basements or in the above-ground flames and melting asphalt of the streets. 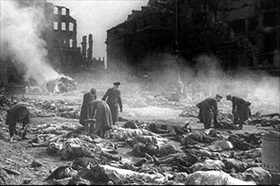 Gomor­rah killed 42,600 people and left 37,000 wounded. Fearing further hor­ren­dous air raids, approx­i­mately 1.2 mil­lion peo­ple, or two-thirds of Ham­burg’s popu­la­tion, fled the city in the after­math. The indus­trial losses were severe, and Ham­burg never recovered to full production. Above: Collecting victims and making a pyre in Dres­den in the wake of four mid-Febru­ary 1945 Allied air raids. A city of 642,000 (1939) swelled by 300,000 refu­gees fleeing from fighting on the East­ern Front, Dres­den was the Third Reich’s seventh largest city. It was also home to 127 medium-to-large fac­tories and work­shops that sup­plied the Ger­man army with matériel (per the Ger­man Wea­pons Office) and employed 50,000 workers. Some 1,249 RAF and USAAF bombers unloaded more than 3,900 tons of incen­diary and high-explo­sive bombs on the city’s cen­ter, causing a fire­storm that incinerated 15 sq. miles and between 22,700 and 25,000 people. Tempera­tures in­side the city’s famous cathe­dral, the Frauen­kirche, reached an estimated 1,832F (1,000C). 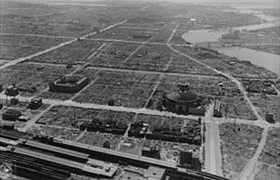 Above: Tokyo after the March 9–10, 1945 bombing. The Dante-esque raid by B-29 Super­for­tresses on a densely popu­lated area of 16 sq. 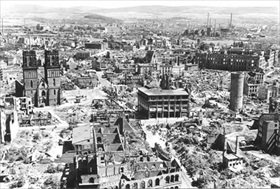 miles proved the single-most destruc­tive bombing raid in history: 267,000 mostly wooden buildings were destroyed and an estimated 100,000 killed—the highest loss of life of any aerial bom­bard­ment of the war, including victims of Ham­burg (42,600), Ber­lin (20,000–50,000), Dres­den (25,000), Hiro­shima (70,000–80,000), and Naga­saki (40,000–75,000). 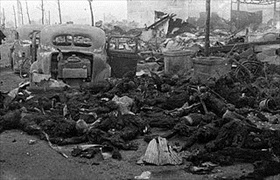 Tokyo was sub­jected to over 18 bombings by four-engine B-29s and many twin-engine bombers and carrier-based aircraft. By the end of the war most of Tokyo’s urban-indus­trial areas had been reduced to ashes and its indus­trial output reduced by half.